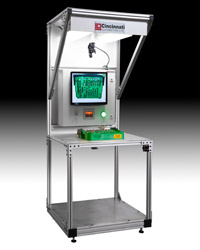 Keyence CV5000 series vision controller with a high resolution color camera can be used to verify the presence and correct orientation of dozens of small components in plastic trays or boxes that are manually loaded by operators. The Keyence vision system can be programmed to save failed images and to report pass/fail data to customer's computer. Trays that pass inspection are released out of the system. Trays that failed any of the inspections are held in place with locking pins. Those trays can be reworked in process and then re-inspected by the system until they passed all inspections. A touch screen HMI is used to display good/bad counts and for quick and easy tray part number selection. The HMI could also be used for password protected manual override for trays that cannot be reworked in process. The inspection camera(s) is installed above the work surface along with high frequency fluorescent or LED white lighting.